Egg salad in avocado boats is an easy meal to make with your leftover decorated Easter eggs. A simple egg salad recipe studded with fresh chives and celery is scooped into creamy avocado. Not only is the presentation beautiful but it is a delicious way to get your fill of omega-3's. Feel free to use your favorite egg salad recipe and simply swap out the bread for avocado. Step 1: Chop the hard boiled eggs, both whites and yolks, into bite sized pieces. Set aside. Step 2: In a medium sized bowl, whisk together mayonnaise, mustard, and lemon juice. Add the chopped hard boiled eggs, chives, and celery and mix together. Season with salt and pepper. Step 3: Cut the avocado in half and remove the pit. 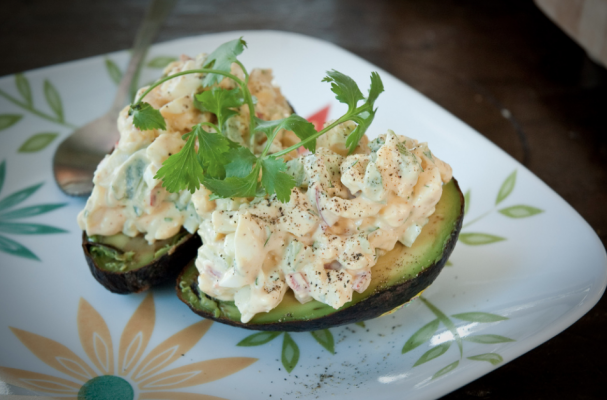 Divide the egg salad into two portions and scoop each portion in the avocado halves. Garnish with smoked paprika and fresh chives.